U25B 814 at Fort Smith, Arkansas on July 8, 1980 (Paul Strang). 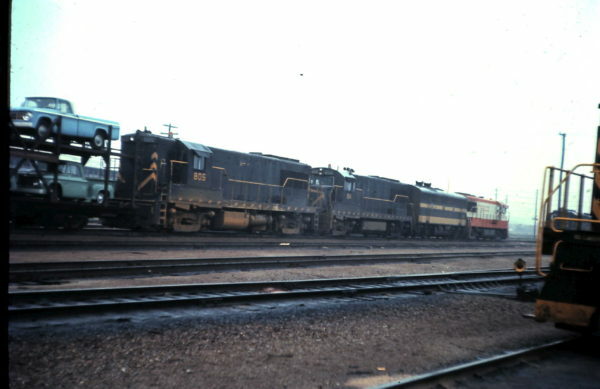 U25Bs 805 and 814 at Springfield, Missouri (date unknown). 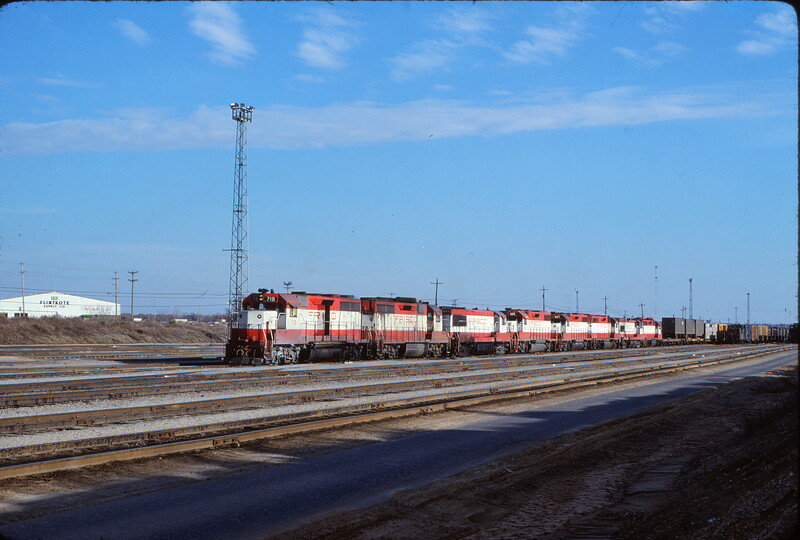 The train is westbound entering the east end of Springfield Yard. This yard was also known as West Yard or Kansas Avenue Yard. Behind U25B 805, through the bi-level automobile carrier or autorack, one can see the northwest corner of the Springfield Stockyards. The head end locomotive is south of the service tracks area. The oily track in the foreground is the lead to the east end of the service tracks area and further west the diesel shop. The photograph was taken from the diesel pocket-track. This locomotive longer term storage track is east of the Springfield Diesel Shop. 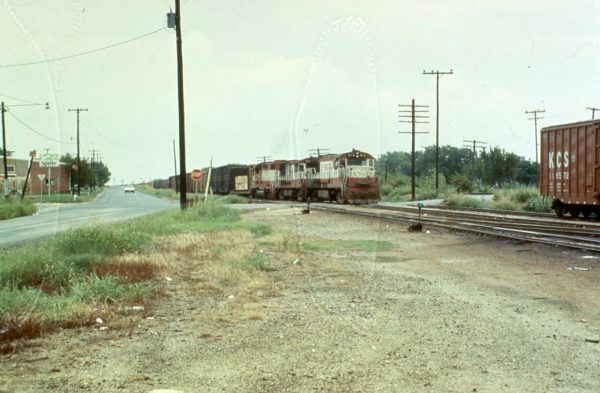 Directly behind the photographer is the east end lead to the West Shops area, Benwood Yard and Clinton Subdivision. Note the Alco locomotive parked on the diesel pocket track. 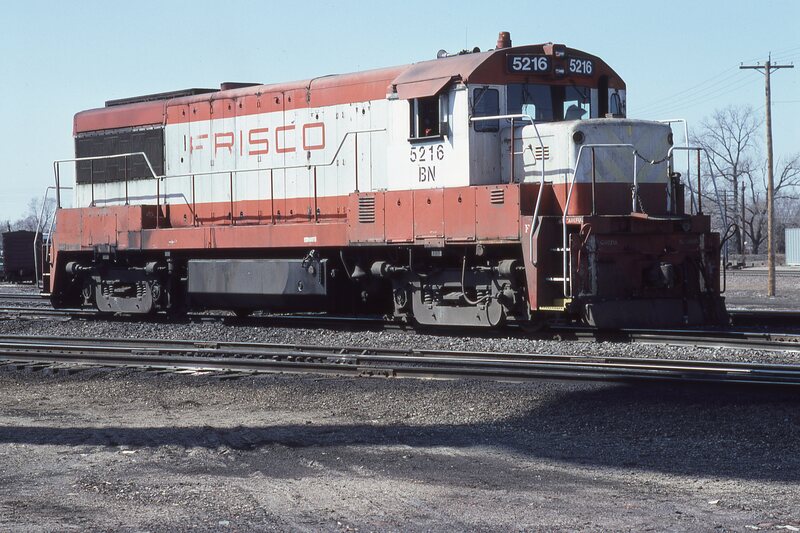 The distinctive lower railing with hooped end just above the pilot was a common feature on their early locomotives, including Frisco owned models S-2, RS-1 and RS-2. In the distance, through its handrails, can be seen additional locomotives at the service tracks area. The photograph was taken between early 1965 and late 1967. The earlier date is established by the presence of a locomotive in mandarin orange and white paint. 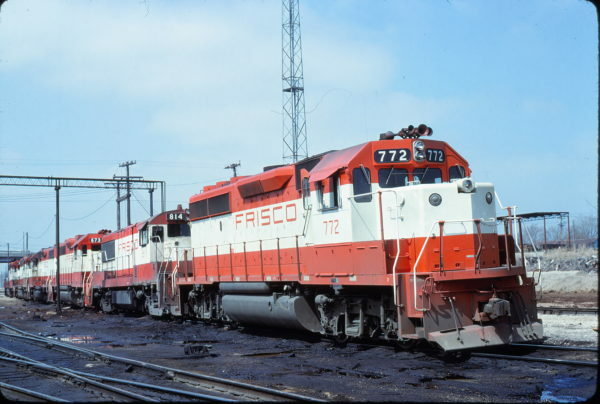 This paint scheme first appeared on U25Bs 802 (repainted on February 14, 1965), and 816 (delivered new on March 12, 1965). The later date is established by the second generation Dodge D Series grills on the pickup trucks (model years 1965-1967). The grills were modified to a different design with the 1968 model year. 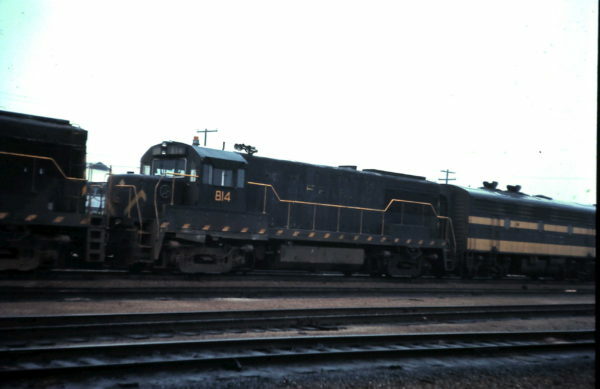 U25B 814 at Birmingham, Alabama in February 1977 (Vernon Ryder). U25B 5216 (Frisco 814) (location unknown) in March 1981. U25B 814 at Springfield, Missouri (date unknown). The subject locomotive is westbound entering Springfield Yard. It one of four locomotives in consist that include U25B 829, F9B 5146, and U25Bs 814 and 805. The lead unit is in mandarin orange and white paint, while the following units are in black and yellow paint. All of these units are equipped with dynamic brakes. 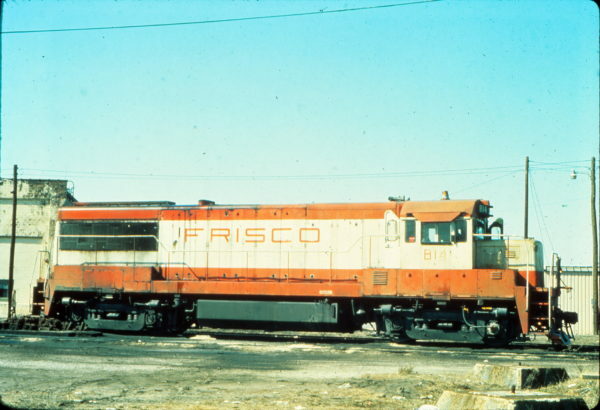 An interesting note; when the Frisco acquired its first five-unit order of F9Bs (5140-5144) in January 1954, they did not own any cab equipped control units with dynamic brakes. This changed in February when two wreck-damaged former F3A units (5005 and 5007) were rebuilt and delivered by EMD. They now featured F9A car bodies, equipment and dynamic brakes. An additional order of nine dynamic brake equipped F9B units, (5145-5152), followed in April and May 1957. However, no new dynamic brake control units were added. This would change in 1961 with the arrival of the first General Electric U25Bs. 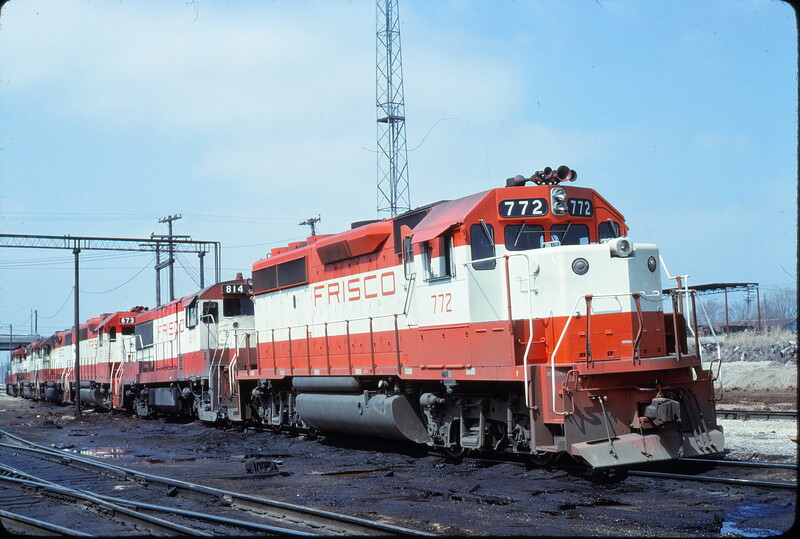 Subsequent GE and EMD were largely ordered with this brake option. Visible in the distance to the left, and above the locomotive’s nose, are the Springfield Stockyards. 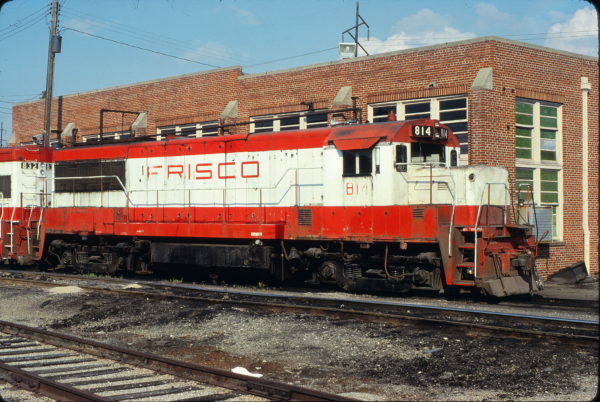 The stockyards were on south of the Frisco’s tracks, located between North Broadway Avenue on the east and North Kansas Avenue on the west. 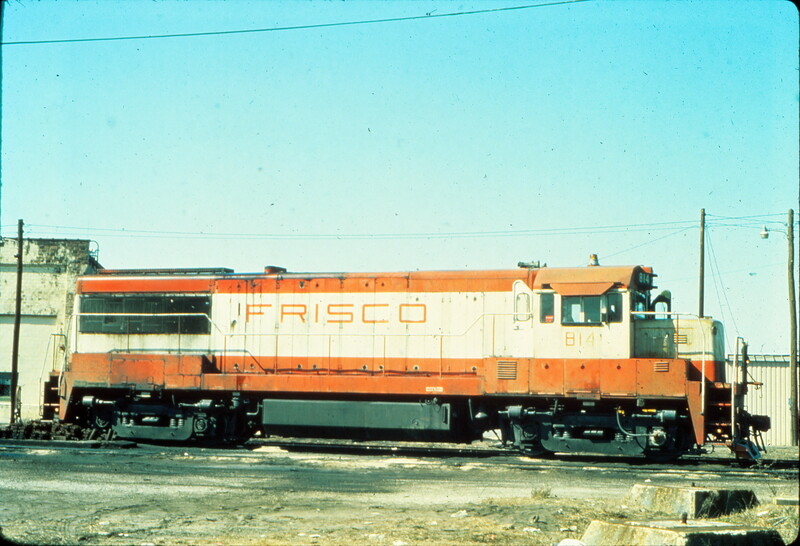 The Frisco Archive includes additional photographs of this train. Please see these related images: 1, 2, 3. 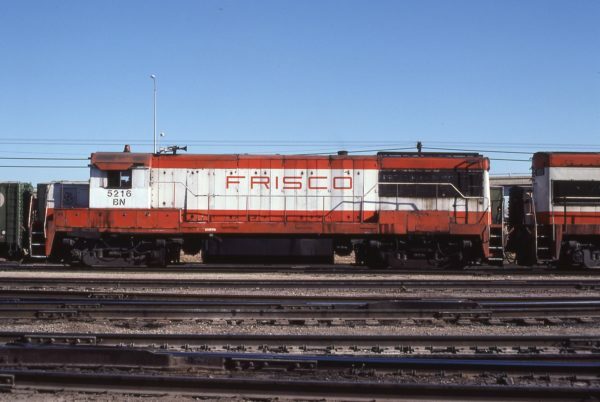 U25B 5216 (Frisco 814) at St. Louis, Missouri in January 1981 (Don Heiberger). 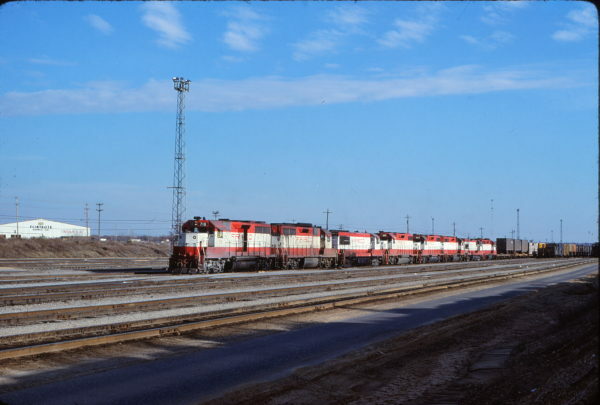 U25Bs 814 and 827 lead a train at Sherman, Texas (date unknown). 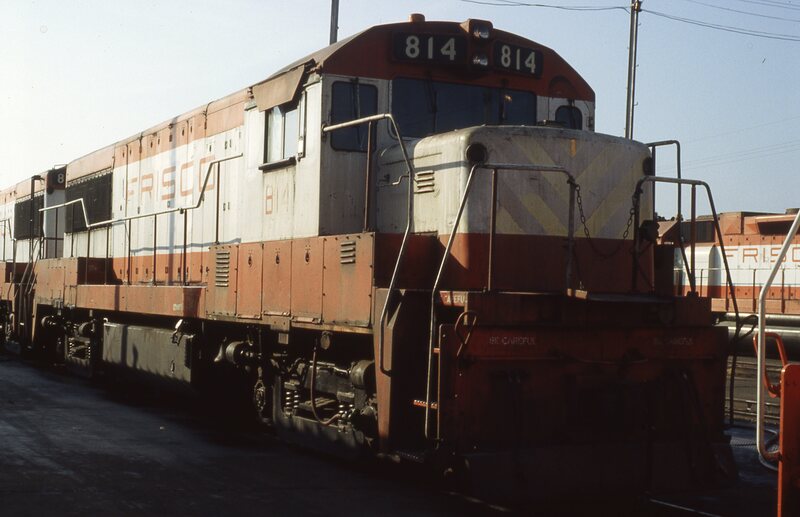 U25B 814 at Memphis, Tennessee on September 1, 1980 (P.B. Wendt).